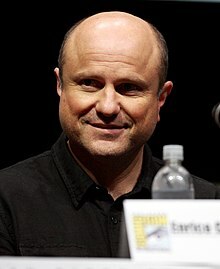 Enrico Colantoni (born February 14, 1963) is a Canadian actor and director, best known for portraying Elliot DiMauro in the sitcom Just Shoot Me!, Keith Mars on the television series Veronica Mars, Louis Lutz on the short-lived sitcom Hope & Gloria, crime lord Carl Elias on ‘’Person of Interest’’, and Sergeant Greg Parker on the television series Flashpoint. He has also had supporting roles in such films as The Wrong Guy, Galaxy Quest, A.I. Artificial Intelligence, and Contagion, and guest appearances on Monk, Numb3rs, Party Down, Stargate SG-1, and Bones. More recently, he starred as Allen Conner in Remedy, and played crime boss Carl Elias in a recurring role on Person of Interest. He played Laura Hollis' father in season three of the online web series Carmilla. He most recently appeared as Vincent Ingram in Travelers. 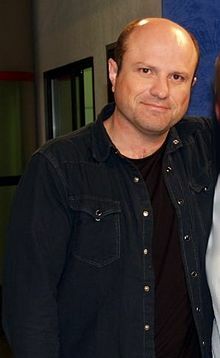 Colantoni directed two episodes of the TV series iZombie. Colantoni was born in Toronto, Ontario, the son of Gina, a garment worker, and Quintino Colantoni, a labourer and truck driver. Both his parents were immigrants from Italy, and his brother, Det. Sgt. Hector Colantoni, is a retired police officer with the Toronto Police Service. He attended the University of Toronto studying psychology and sociology, but transferred to the American Academy of Dramatic Arts in New York City. Colantoni graduated from the Yale School of Drama, winning the Carol Dye Award. Colantoni starred in the TV series Remedy. He appeared in the Canadian TV police drama Flashpoint as Sgt. Greg Parker (also airing in the U.S. on ION Television, and airing previously on CBS). His older brother, who was a Toronto policeman for the past 30 years, advised Colantoni on how to play the character. Colantoni also had a recurring role on Person of Interest as crime boss Carl Elias and on Travelers as Vincent Ingram (Traveller 001). Since 2011, Colantoni has been heavily involved with The Tema Conter Memorial Trust, an organization that assists first responders and other service personnel deal with post-traumatic stress disorder. He became their official spokesperson and has been involved in their annual tribute gala in Toronto every year since. He has also been involved in the Companion Animal Protection Society's campaign to boycott commercial pet stores, creating a video to raise awareness about the topic. On November 11, 2011, Colantoni married his fiancée, Rosanna Francioni. 1987 Night Heat Episode: "The Wiseguy"
1987 Friday the 13th: The Series Adrian Episode: "Root of All Evil"
1994 Law & Order Ron Blocker Episode: "Censure"
1994 New York Undercover David Kinsoling Episode: "After Shakespeare"
1994 NYPD Blue Danny Breen, Jr. Episode: "You Bet Your Life"
1995 NYPD Blue Danny Breen, Jr. Episode: "Don We Now Our Gay Apparel"
1997 Life's Work Marty Cranepool Episode: "Neighbors"
2000 3rd Rock from the Sun Frankie Episode: "Frankie Goes to Rutherford"
2001 The Outer Limits Michael Burr Episode: "Think Like a Dinosaur"
2002 Kim Possible Dr. Cyrus Bortel (voice) Episode: "The Twin Factor"
2003 Whoopi Victor Episode: "Pilot"
2003 Justice League Glorious Gordon Godfrey (voice) Episode: "Eclipsed"
2003 Missing Charles Denton Episode: "White Whale"
2003 Stargate SG-1 Burke Episode: "Evolution: Part 2"
2004 Century City Frank Summers Episode: "Sweet Child of Mine"
2004 Monk Joe Christie Episode: "Mr. Monk and the Employee of the Month"
2004 Kim Possible Dr. Cyrus Bortel (voice) Episode: "Emotion Sickness"
2007 CSI: Crime Scene Investigation Preston Episode: "Leapin' Lizards"
2007 Numb3rs Ben Episode: "Chinese Box"
2008 Brothers & Sisters Evan Episode: "Compromises"
2009 Party Down Gordon McSpadden Episode: "Willow Canyon Homeowners Annual Party"
2009 Glenn Martin, DDS (voice) Episode: "We've Created a Mobster"
2010 Cra$h & Burn Danny DeRossi Episode: "Lawyers, Guns & Money"
2010 Bones Micah Leggat Episode: "The Doctor in the Photo"
2013 Malibu Country Leslie Sallinger Episode: "Marriage, Malibu Style"
2013 Warehouse 13 Anthony Bishop Episode: "The Big Snag"
2013 Hot in Cleveland Julian Episode: "All My Exes"
2014 Republic of Doyle Donny Pearl Episode: "Smash Derby"
2015 Rookie Blue K-9 Unit Episode: "Perfect Family"
2017 Ransom Joe Morris Episode: "Joe"
2017 Madam Secretary Jim Fox Episode: "Convergence"
^ "Enrico Colantoni Biography (1963-)". Film Reference. Retrieved April 18, 2015. ^ a b Kalanderopoulos, Christopher (February 23, 2011). "Asking for Help". Eggplante!. ^ "Enrico Colantoni". The New York Times. Retrieved April 18, 2015. ^ DeMara, Bruce (10 July 2008). "Flashpoint star brings work home to Toronto". Toronto Star. ^ Zier, Vogel, Lindsay (September 27, 2012). "Enrico Colantoni reflects on Sgt. Greg Parker's intense 'Flashpoint' journey" Archived 2015-04-19 at the Wayback Machine CTV. ^ Schwartz, Terri (November 25, 2014). "Enrico Colantoni is grateful 'Person of Interest's' writers haven't killed Elias off". Zap2it. ^ "CAPS PSA with Enrico Colantoni ". Companion Animal Protection Society. December 21, 2011. ^ Colantoni, Enrico [@ricocolantoni] (November 24, 2011). "Rosanna and I got married on 11/11/11. Hugh Dillon and his wife were the witnesses. It was quiet and beautiful. Party TBD" (Tweet). Retrieved September 21, 2017 – via Twitter.